Of Course this is inspired by Tim’s original Tag. This month focused on 2 main things Smudge stamping a technique I really love to give a fuzzy worn look to images and things and the new craft spritzer. Which I have yet to add to my stash. I did two lots of tags for this month because I ruined the first set you know that gut wrenching feeling when you use a colour that is normally light and it goes on way to dark yep that happened. Then used the Compass and the butterfly stamp from my Tim Stamp Stash. Also using the same technique. I added a quote from Tim’s say it stamps and some tissue tape and viola this months tag. I rather like the pinkness of it as its something a little different for me. I recently had one of those moments of Panic, you know the ones someone important has just have a birthday, you are seeing them the next day and have zero inspiration on what the to do for their card. 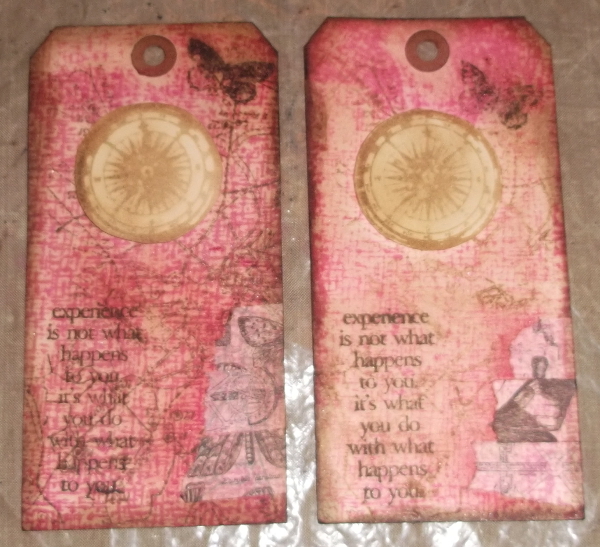 It is one of the reasons I love Splitcoast Stampers I can always turn to them for a tutorial and indeed I found an idea to play with called Layered Stamping. I kept it pretty simple and was surprised at how quickly it came together. I am sure I will have a play with this technique again at some point. I have to say my kit challenged me. For many reasons one being that I mostly do pretty girly things. Though I do love to stretch my creative boundaries. On occassion I will find a project to do in a masculine way just because I want the practice at not doing ‘Pretty’ as such. What I loved about this kit is that it also still had flowers and lace in it. All I added to this kit was: Brilliance Coffee Bean Ink, Versamark Watermark Ink, Ranger Antiquities Frosted Crystal embossing powder and Distress Mustard Seed Embossing Powder, Enjoy the Journey Stamps, Buzz and Bloom Pretty things (either one and two or two and three I can never remember which of the 3 sets of I have), Some hero arts back of card sentiment stamps, washi tape and some Kraft CS. I really love how well the lace worked on the first two cards. I know it is not usual to use lace or flowers on mens stuff but I wanted to show it can be done . and thats it for guest DT spot number 2 I really enjoyed the challenge and whilst it did make me scratch my head a little and wonder what on earth I was going to do for it. Once I started to play the Ideas flowed and you can see the results. Things I am or have Participated in.